Be the first to share your favorite memory, photo or story of Donald M.. This memorial page is dedicated for family, friends and future generations to celebrate the life of their loved one. 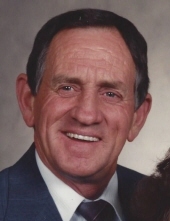 A Bloomfield resident, Mr. Donald M. “Donnie” Roberts, age 80, passed away Thursday, April 4, 2019 at his residence. He was born October 26, 1938 in Spencer County to the late Lawrence and Lola Moore Roberts. Donnie was a farmer, the former owner of Bloomfield Chevron and Kentucky Tire, a former employee of Bloomfield Western Auto, and was a member of Bloomfield Baptist Church where he faithfully served on many committees. He was an avid UK fan and outdoorsman, and loved to make people laugh. Along with his parents, he was preceded in death by a sister, Nancy Donnelly, and 6 brothers, Lawrence “Rats”, James, Eddie, and B.F. “Bull”, Louis and T.B. Roberts. He is survived by his wife, Emma Joyce Terrell Roberts, 2 daughters, Becky Whitfield of Bardstown, Karen Kirtland of Canton, GA., his son, Tim Roberts of Nazareth, a sister, Margie (Dale) Carter of Louisville, and 6 grandchildren, Maggie, Sarah and Jack Whitfield, Anna, Isaac and Michael Kirtland. Funeral services for Mr. Donald M. “Donnie” Roberts will be 11:00 am Monday, April 8, 2019 at the Bloomfield Baptist Church. Bro. Richard Carwile and Bro. Tom Sparrow will officiate. Interment will be in Maple Grove Cemetery. Visitation will be Sunday from 3:00-8:00 pm at the church. The family requests that expressions of sympathy take the form of contribution to the Bloomfield Baptist Church. The Houghlin Funeral Home of Bloomfield is in charge of arrangements. To send flowers or a remembrance gift to the family of Donald M. "Donnie" Roberts, please visit our Tribute Store. "Email Address" would like to share the life celebration of Donald M. "Donnie" Roberts. Click on the "link" to go to share a favorite memory or leave a condolence message for the family.